The KinderBoard is an excellent first keyboard with large, 1 inch square keys and easy-to-read numbers and letters. Consonants, vowels, numbers and punctuation marks are color-coded to help pre-school children. 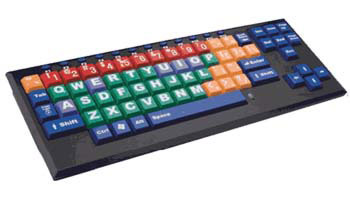 The KinderBoard™ is an excellent first keyboardwith large, 1 inch square keys and easy-to-read numbers and letters. Consonants,vowels, numbers and punctuation marks are color-coded to help pre-schoolchildren learn their alphabet and identify character sets.